Volunteers young and old help create Wales’ new First World War Centenary Wood. Over 3,000 native trees have been planted at Coed Ffos Las, Wales’ First World War Centenary Wood, which the Trust is creating near Kidwelly. And these trees planted will be part of the Plant! project, which aims to celebrate the birth or adoption of every child in Wales by planting trees. 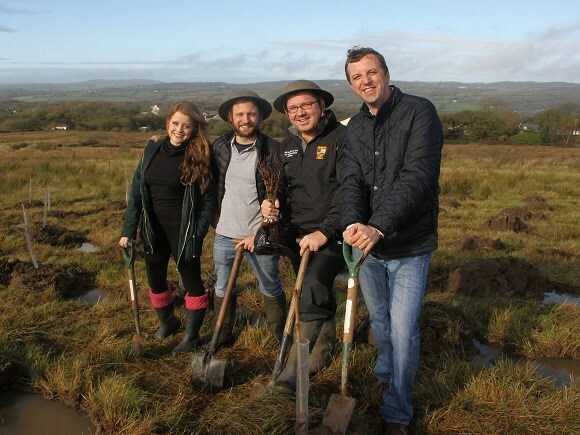 Following a successful public fundraising campaign last year, he Woodland Trust (Coed Cadw) organised a full week of tree planting events, for ten local primary schools from Monday to Friday, and then for the wider public on the Saturday. Amongst the keenest tree planters involved on the Saturday were Soldiers of 224 (Pembroke Yeomanry) Transport Squadron, from Carmarthen and Haverfordwest Army Reserve Centres. The soldiers were the driving force and helped plant nearly 1000 trees. Last year, hundreds of people put their hands in their pockets to raise £400,000 to enable the Woodland Trust to secure the 120 acre site which is to become Coed Ffos Las. National Resources Wales have now generously contributed £20,000 towards the cost of the trees at the site and over £526,000 has now been raised towards the total cost of the project, which is £1.2m. The aim is to create a beautiful, poignant new woodland which will incorporate not just many acres of native trees, but also an orchard, bee hives, a pond, an area of coppiced woodland, open areas for enjoying the panoramic views and a wonderful war horse sculpture as a commemorative feature. More funding still needs to be raised however and the appeal is still open. The creation of a First World War Centenary Wood in Wales is proposed to be part of the Cymru’n Cofio/Wales Remembers project, which includes at least 19 partner organisations working together mark the centenary of the First World War in Wales. The First World War Centenary Woods project is supported by the Trust’s lead partner Sainsbury’s, helping plant millions of native trees to commemorate the First World War.